The dwarf planets Ceres and Pluto both reach opposition in the next two weeks. Here are their positions on Friday, June 18, 2010. Thismonth two dwarf planets — Ceres and Pluto — come into opposition with the sun,offering a rare view of these tiny worlds in the night sky. What,you may ask, is a "dwarf planet"? Basically it is a solar systemobject which is too small to qualify as a planet. Interestinglyenough, both Ceresand Pluto were, at the time of their discovery, considered to be planets. When GiuseppePiazzi discovered Ceres on the first night of the nineteenth century, hethought he had discovered a new planet circling in an orbit between Mars andJupiter. Later Ceres was demoted to become the largest of the asteroids, but in2006 was elevated to the newly created status of dwarfplanet. Ceresis named for the Roman goddess of plants, the same source from which our word "cereal"comes. It is a small world, just 580 miles (940 km) in diameter. Similarly,when Clyde Tombaugh discovered Pluto in 1930, he thought it was a new planet inan orbit beyond Neptune. However, its small size and peculiar orbit ledastronomers to doubt its status; in 2006 Pluto too wasreclassified as a dwarf planet. Pluto was named by an 11-year-old English girl, Venetia Burney,after the Roman god of the Underworld. It is a little more than twice the sizeof Ceres, 1,430 miles (2,300 km) in diameter, slightly smaller than Eris, thelargest dwarf planet. All of these dwarfs are tiny compared to our moon, 2,170miles (3,500 km) in diameter. 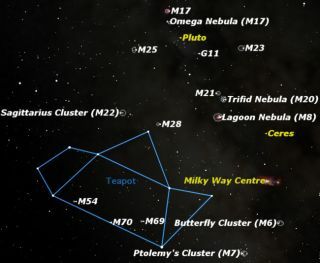 Cerescomes to opposition on Friday, June 18, and Pluto a week later on June 25.However, the moon is Full on June 26 and quite close to Pluto in the sky on the25th, so it would be better to try hunting it down at the same time as Ceres. Thegraphic shows the location of both dwarfs on June 19, a bit past midnight,against the backdrop of the constellation Sagittarius. OnJune 18, Ceres will reach magnitude 7.2, so binoculars will be necessary tospot it. (On this astronomers' scale, larger numbers represent dimmer objects. The faintest object visible to the naked eye under perfectly dark skies is about magnitude 6.5) Sagittarius is one of the most crowded areas of the sky, so a staratlas or planetarium software would be helpful to distinguish Ceres from thebackground stars. Try to observe Ceres again a night or two later, so that youcan confirm, by its motion, that you actually saw the asteroid, and not a star. FindingPluto will be a much greater challenge, since it is about seven magnitudesfainter than Ceres, magnitude 14.0! You will need a telescope with at least 10inches aperture, a fairly high magnification, and a very detailed finder chart.Again, you will need to plot Pluto?s position over two or three nights to becertain of its location. If you manage to observe these two objects this month, youwill be one of the very few people on Earth to have seen two dwarf planets.Admittedly, they aren?t very exciting objects to look at, nothing more thanpinpoints of light, but when you think of them as tiny worlds in the vastnessof space, they are quite awesome.